This vegetable hash recipe in a cast iron skillet is perfect for breakfast, lunch and dinner. It is quick to throw together and easy to clean up. Best of all, it is healthy and a great meal for a family! 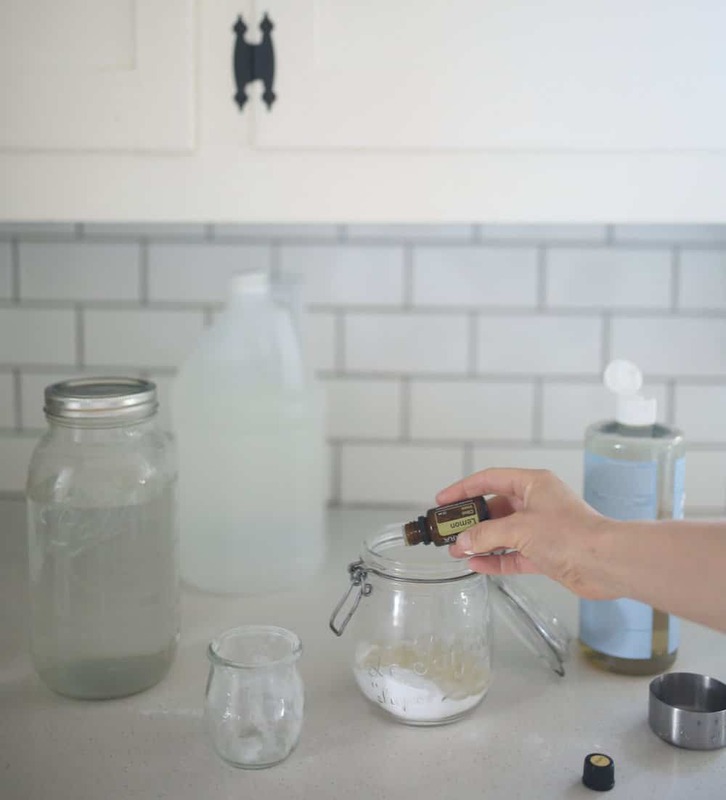 Want to learn more about essential oils and how to incorporate them into your natural home? Get my free essential oils class HERE. 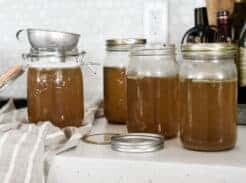 I have to admit, it is easier for me to adapt to a healthier diet than it is for me to address the toxins lurking in our home. I have read that the mattresses we sleep on are toxic, our cellphones emit harmful EMF’s and new furniture off-gases toxins for years after purchasing it. It can honestly all get so overwhelming. I know these things truly are important, and there is no debate that our health as a population is declining. So, where on earth does a person start? 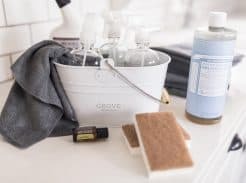 It is impossible to avoid every single negative thing in this world, but swapping out toxic cleaning and laundry products is a really simple change to make. 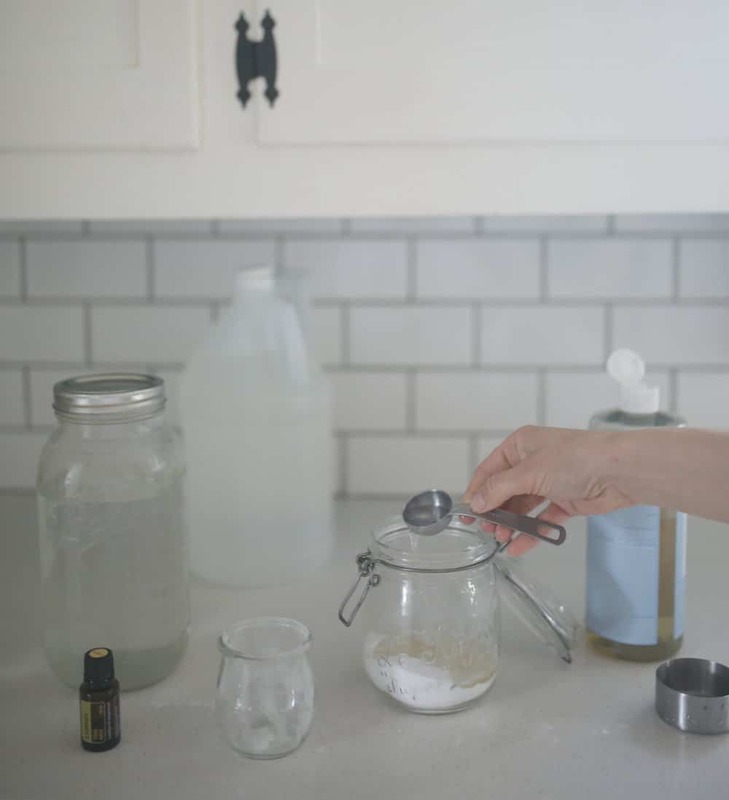 I love that it only takes a handful of basic ingredients to create so many effective household cleaning products. 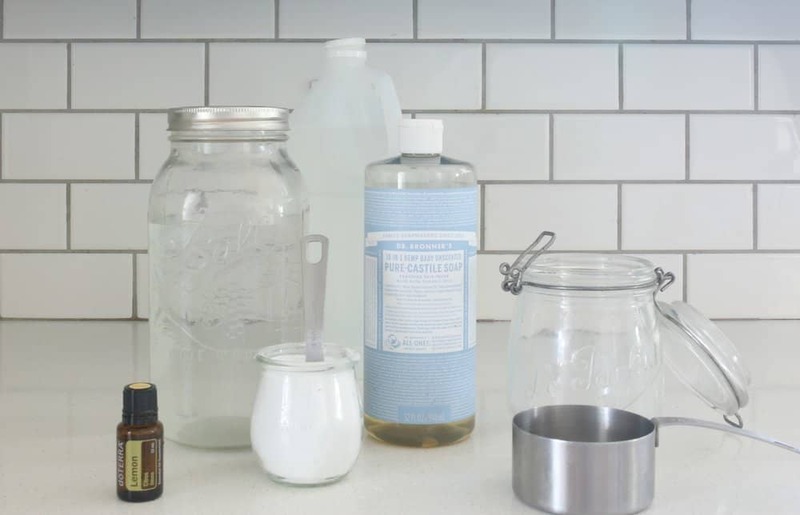 I shared last week how to make a simple DIY All Purpose Cleaner. 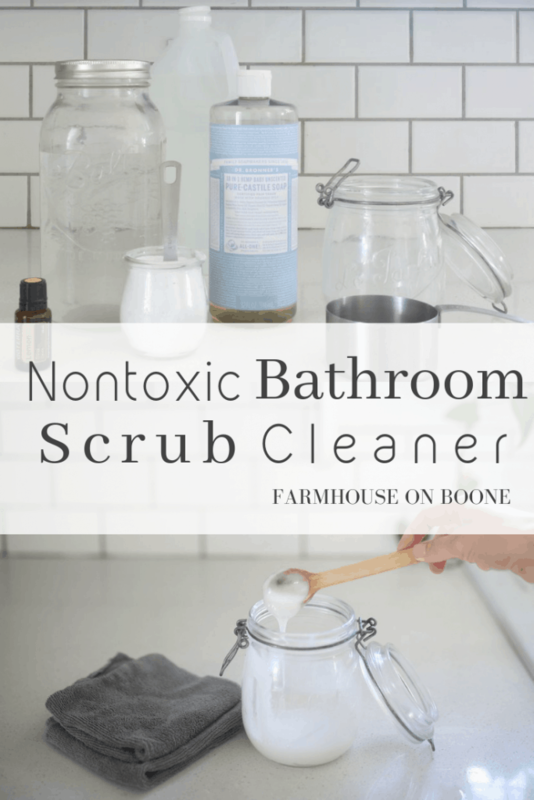 Today’s Bathroom Scrub Cleaner is for those jobs that need a little more scrubbing power, like soap scum, hard water stains and bathtub rings. All of which I encounter on the regular…..but address not-so regularly, if you know what I mean, Which is why I need the tough stuff! This recipe is super simple to throw together. 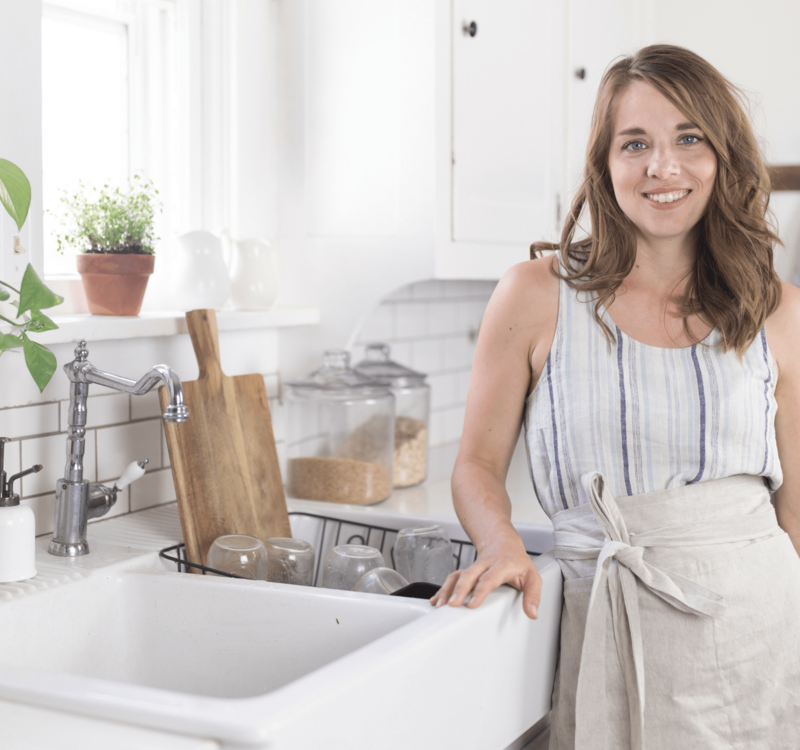 If you want to make all the recipes in my FREE Cleaning with Essential Oils Ebook, I recommend getting out all the ingredients and spending 30 minutes making them all at once. That way you have enough cleaning products ready to go for the month! First, add in the 3/4 cup of baking soda. 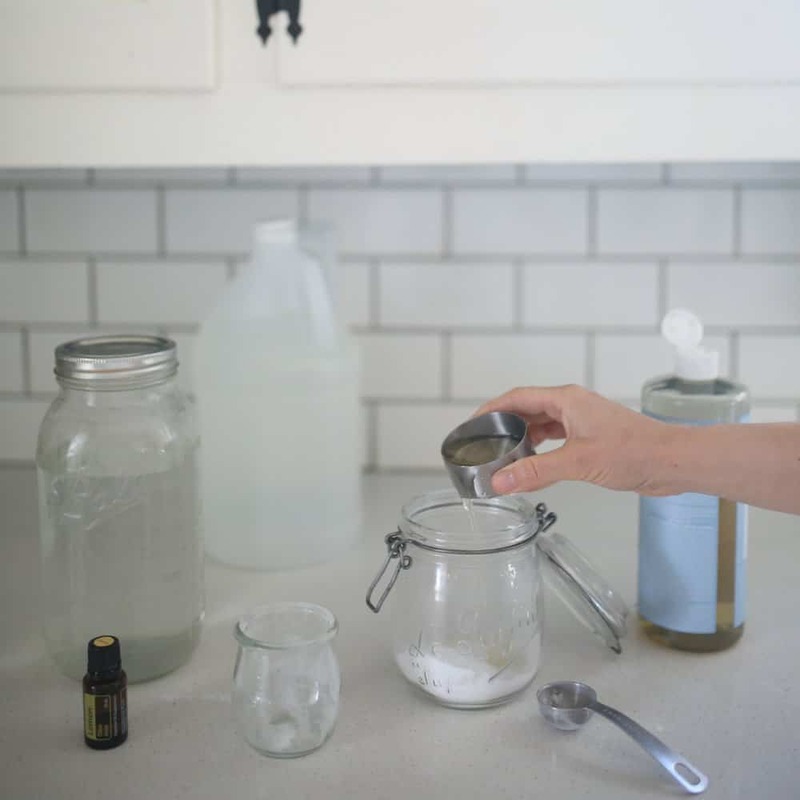 Next, add in the 1/4 cup of unscented Castile Soap. Add in one tablespoon of water. Finally, add in 10 drops of lemon essential oil. 1. It is excellent at cutting grime and grease. 2. It has a refreshing and clean smell. The final product will have the consistency of a paste. I use it as a natural toilet bowl cleaner, by scooping a little into the toilet and then cleaning as usual with the brush. 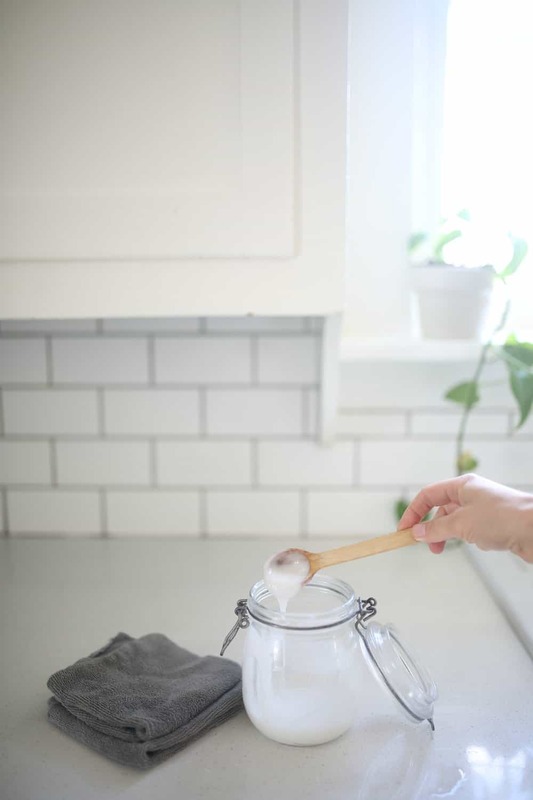 For soap scum and tub rings, slather the solution all over the area you want to clean. Allow it to sit for a few minutes and work its magic. Scrub it away with a towel and hot water. I recommend cleaning with microfiber cloths, because they have so much more scrubbing power behind them. This is what I use. 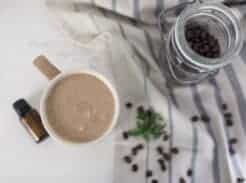 I hope you enjoy this recipe, at least as much as you can enjoy a product used to scrub toilets and soap scum! The final product will have the consistency of a paste. I use it as a natural toilet bowl cleaner, by scooping a little into the toilet and then cleaning as usual with the brush. 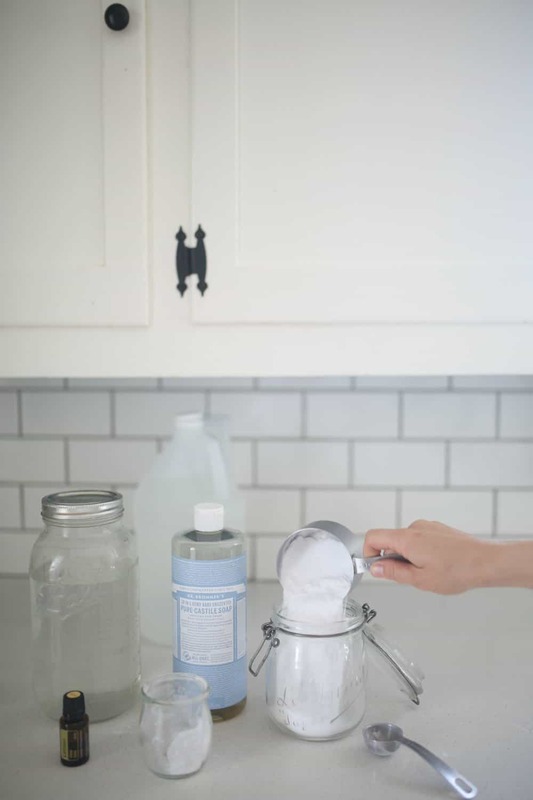 For soap scum and tub rings, slather the solution all over the area you want to clean. Allow it to sit for a few minutes and work its magic. Scrub it away with a towel and hot water. I recommend cleaning with microfiber cloths, because they have so much more scrubbing power behind them. This is what I use. It is very scary to know how toxic our homes can be— If you want to know a wonderful solution to your mattress let me know. I sell Norwex products, and our mattress cleaner is amazing. Thank you! I LOVE Norwex. Use it every single day!